At long last - a release for Mac OS X. This was tested on Leopard (10.5.3 to be precise) on an Intel based machine, but should run on others as well. Please throw something at thebackupmonkey@thegoogleymail if you run into any problems. Extract the zip file and copy the resulting folder to your Applications folder. Open a terminal (Applications -> Utilities -> Terminal). Enter /Applications/Bonkey/install.sh and press enter. Tried the Windows version. Attempted to connect to FTP server. Always said "cannot read filesystem". It *was* able to connect, since it gave a different error message if I put in a bad path. Looks like a great piece of code otherwise! Thanks walksabout. Others have reported the same bug. I'll be trying to address it this weekend. This is fixed now - FTP should work fine in the new version. i'm getting continuous errors... could not create folder blah... but the folders already exist!?! is this a known issue. is there a config that can address it? I'm not sure I can offer much on that without more details - what are you trying to do when you get the error? trying the mac version, but whenever I don't think that the automatic service is working on my machine. I can't see any bonkey services running in the activity monitor, and when I try to run in manually via "launchctl start com.bonkey.BonkeyService.plist" it says "launchctl start error: No such process" I have already run the install.sh file. Love it so far though! "346 - com.bonkey.BonkeyService". If there is no PID, the service isn't running. To load it manually, you need to use two commands: "launchctl load your_path/com.bonkey.BonkeyService.plist" and then "launchctl start com.bonkey.BonkeyService". Have a look at the install.sh script distributed with Bonkey for the details of the plist file. Ping me at thebackupmonkey on gmail for more info if needed. where does it backup to? how to set-up so it will back up to a external drive? how to backup eutourage emails? It backs up to wherever you choose under "Target" for each backup group. To backup to an external drive, choose "Create new target" and choose the external drive. I'm afraid I know nothing about "eutourage" email. However, if you know which files contain your mail, you can back those up. Firstly - Bonkey is great! It works so well for what I'm doing - backing up a remote server to my local hard drive via SFTP. However... the errors that Anonymous was getting on 21st November sound like the ones I'm getting. Entering launchctl start com.bonkey.BonkeyService just sets off those errors again, starting with "Exception in thread...". I'm on 10.4.11 though, so I think that might be the reason. Could it be 10.5-only? The application itself works really well but it's just the automatic bit which is giving these errors. It may still be working however, I haven't had it on long enough to find out! Hey Joe - if you have the full exception text, could you send it to thebackupmonkey@gmail? It seems more likely to be related to the version of Java than of OS X, but seeing the actual errors might be useful. What version of Java do you have? Also, did you run install.sh from the directory that you are running Bonkey from? Full exception text... that's as much as I could see! Would there be some more in a log file, perhaps? I'd be happy to look if you could tell me where to find it! I guess that may also not help things! When I get chance, I'll try replacing the ~/Library/LaunchAgents/ plist file with the right paths and see what happens! Joe, you may have to use launchctl to remove the current entry before amending the plist file and reloading it. Apart from that, hopefully that should fix your problem. Regarding not saving locations, you should have a "user" directory in the directory that Bonkey runs from. That should contain xml config files. If there is not one, it may be due to permissions. Otherwise, it may be Java 6 funkiness - it is hard to know from here. 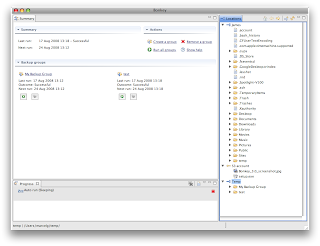 Just tried Bonkey on Mac OS 10.4.11 for FTP backup of local files. Configuring locations is difficult. Is there a way to edit them after they are created ? Did not find anything about this. Should have more options about which FTP folder to backup to. Bonkey is having difficulties connecting to the FTP server. Since I can't edit targets, I need to recrete a new one !!! You're right, there is no way to edit locations, other than to manually edit the configuration file (Bonkey/user/config.xml). You need to create a new one. Regarding specifying the folder, just add the path to the location (eg ftp://ftp.host.org/my/full/path/). How do you completely uninstall this on a MAC? Do you know how can I solve this problem ? No idea I'm afraid! Bonkey uses a third party FTP library, so if it can't handle those kinds of characters, I'm afraid there's not much that can be done about it. Hi i've just installed bonkey on mac osx but i'm unable to get the service to start. I want bonkey to automatically backup in the background. When I try and start the service using start-bonkey-service.sh I just get a "Could not listen on port: 6738". If I run launchctl list I can see the bonkey service listed but it has no pid and has a 1 under the status column. I've previously ran the install.sh file as well but nothing I try will start the service, any ideas? Sounds like that port is either occupied or blocked. Try loading up the Bonkey user interface, going to Preferences->Basic configuration and changing the port that the service is running on. You'll then have to run the install.sh again - if that fails because the service already exists, see the steps in comments above for removing the service and then try again. Let me know if that works! You'll have to give me a bit more detail on what is going wrong before I can help you solve the problem. What happens to your iPhoto files? Hi Love the app. Seems to work really well except I keep getting a weird error message. How do you uninstall Bonkey on Snow Leopard? But it is still dumping blank service.log files in my home directory and it is still throwing up errors in console.app which indicates some part of it is still running on my system. A spotlight search for "Bonkey" resulted in 0 results. Lucky you having Snow Leopard already! I don't, so I have no way to experiment. Open a terminal and run launchctl, then run the list command. You should get a list of all the services that are running. Is Bonkey in that list? What are the details of that entry? If it's easier, you can reach me at thebackupmonkey at gmail. tcsh: launchctl: Command not found. I don't use Terminal often so I have no idea what this means. Do you have any suggestions? The first two 'file exists' warnings are expected, and don't interfere with the installation. These folders are already present on most systems. Launchctl, on the other hand, should be present, but it seems from the errors that it can't be found. You'll have to find it (presuming it's on your system). Try running /bin/launchctl. If that works, run alias launchctl=/bin/launchctl and then run the install script again. 1. Have you tested the latest release on snow leopard? The autorun feature isn't working quite right, as I set the schedule and it didn't run at the set time. I'm not sure whether to attribute this to snow leopard incompatibilities, or some other issue with the program. I made sure to execute install.sh, and it told me that the service was already loaded; however, after typing launchctl list in terminal, there was no PID listed next to the bonkey service, just a 1 under status. P.S. What e-mail can you be reached at? Alternatively, you could have a look at your syslog to see what the errors are. The easiest way is to use the console app, select all messages and filter for strings with bonkey in them. Let me know what you find. Just tried Bonkey on OSX 10.4 and get the message 'requires 10.5 (Leopard) or later'. Is that true now, or is there a version that will work on 10.4, or is there a way of configuring to work on 10.4? 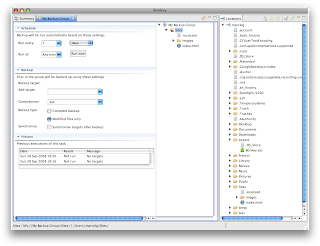 Unfortunately the Eclipse RCP platform on which Bonkey is built no longer supports 10.4 by default. I'll look into it and see if there's anything I can do, but a quick search hasn't turned anything up, so I'm not optimistic. I am working as intern for one company, and it is setting up network for other country, but my company is going to create admin domain at my office, can I use Bonkey for taking backup of office network? Do we need to take any liscence for it? Hi Vaibhav - no license required.